Gmail's mobile web version gets a new look | Smartphone Blast! 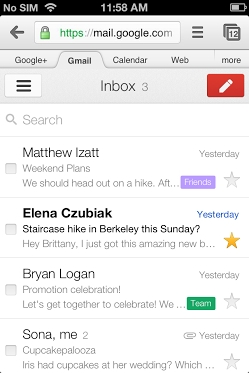 Gmail's latest iOS app has been widely praised for its slick UI. iPhone users have benefited from Gmail 2.0's UI for months, and now Google has brought the same UI to the mobile web version of Gmail and offline Gmail. The new UI works very well and now all platforms can have the elegance that iPhone users have been enjoying since Gmail 2.0 launched.